What could be better than being able to pamper your feet without having to spend hundreds of dollars at a spa, right from the comfort of your home? Whether you are looking for a massager to sooth your aching feet, or a foot spa to spoil mom, there is a foot massager out there for you. Because there are a lot of possible models on the market, choosing the right foot massager can be confusing. 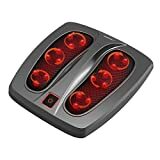 Not all foot spas and massagers are created equal - to help you find the perfect foot massager for you, we have put together this foot massager shopping guide. Manual Foot Massagers: With tubes or balls, these foot massagers are simple to use and cost effective. Rolling balls under the foot, users have control over how hard or soft they want their massage and are able to focus on specific areas of concern. Depending on your budget and needs, they are available in standard or multiple roller types, both helping to improve circulation and relax you. 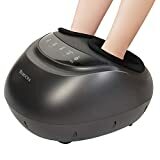 Electric Foot Massagers: Electric foot massagers take all the work out of foot massages by automatically massaging the feet with the push of a button. Varying in the types of massages they offer (vibration, infrared, and shiatsu), speeds, and heat options, these massagers can be adapted to your personal massage preference. Vibrating Massagers: These standard massagers offer gentle massages, numerous speeds, and various features to suit your specific messaging needs . 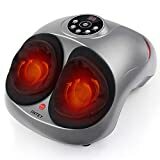 Infrared Massagers: Using infrared heat technology, these are great massagers for helping circulation. 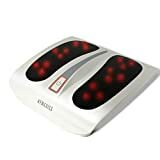 Shiatsu Massagers: Ideal for people who like harder kneading massages and who are looking for good reflexology, these massagers normally allow you to massage two feet at once. Foot and Calf Massagers: With settings for relaxation and reflexology, these massagers not only target both feet at once, but include ankles, calves, and in some cases knees, to make sure your legs and joints are being treated at once. Foot Spa Massagers: These massagers are electric but also allow users to submerge their feet in water for extra relaxation and pampering. With jets and bubbles, not only do they relax and rejuvenate but they exfoliate as well, to give you a full spa experience. Massage: Massagers that massage as hard as they need or as soft as they need are rated higher by their owners. They are rated on the movement and the quality of their massaging rollers to give the best massage. Choosing the right foot massager to match your massaging preference will ensure you get the most comfort out of your massager. Warranty: Reviewers see their foot massagers as an investment, and models that are both durable and include a good warranty are rated much better than those that aren’t and don’t. A warranty will ensure that, if something should go wrong, the unit can be sent back with ease. Variability: This is a top online talking point, especially for owners of foot spa massagers. 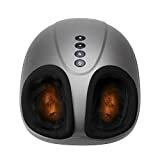 Foot spa massagers that allow for the inclusion of bath salts and other treatment soaps will mean the massager not just massages but that users are able to get the full spa treatment. If this is a concern for you, ensure that your prospective foot spa massager allows for these products to be added to your massager. 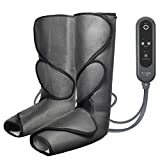 Therapeutic value: Many online reviewers purchase their foot massagers for their therapeutic value, to alleviate pain or increase circulation for health issues. Massagers that achieve this well are crowd pleasers, and units that do not receive disappointing reviews. Choosing a reputable brand with good reviews will ensure better product satisfaction. Choose a massager that is best suited for the type of massage you like, to ensure maximum comfort and satisfaction. For softer, more passive massages, choose a foot spa or an electric foot massager with different speed settings. For harder kneading massagers, shiatsu massagers are a great option. Added cushioning on your foot massager will not only make it non-slip but will give you a more comfortable massages. Foot massagers with heating options are a lot more therapeutic and will leave you feeling more relaxed. Opt for an electric foot massager with multiple speed options to have more massaging adjustments for a more enjoyable foot massage. Electronic massagers that include a remote will allow you to make adjustments without having to stop your massage. Some additional features that can come included with your foot spa are splash guards to prevent water splashing, pedicure attachments for extra pampering, gel inserts for comfort, and aromatherapy dispensers so you can add therapeutic oils to your treatment. When choosing a foot spa massager, consider one with water jets for added relaxation and circulation benefits. PIBBS: Since the 1950’s when launching into the hairstyling industry, The Petruccelli Group has become a leading producer of salon and home appliances. Their foot spa is among the best rated brands that are exported worldwide. Homedics: Founded in 1987, Homedics specialise in massage products and aim to create products that relax and destress the body and simplify the consumers life. MediMassager: Designed for therapeutic use, Medmassager massage products are FDA approved and are aimed at improving circulation and promoting healthier blood flow.